Lived a mother sharp-tailed grouse and her little chicks Six. “Scurry!” said the mother. “We scurry,” said the Six. So they scurried after beetles where the grass and flowers mix. Set in the Badlands of South Dakota, Out on the Prairie features flora and fauna found in this prairie area. The first two page spread shows a mother bison and her single calf wallowing in the dust while surrounded by pretty purple coneflowers known as snakeroot. Bateman explains in the back matter that this flower was used by Native Americans to treat snakebites and other ailments such as stings, toothaches, and sicknesses like measles. Susan Swan’s mixed media illustrations don’t catch your eye. They capture it and demand that you scour every square inch so you notice the big and little details. I believe the word for this is sumptuous. 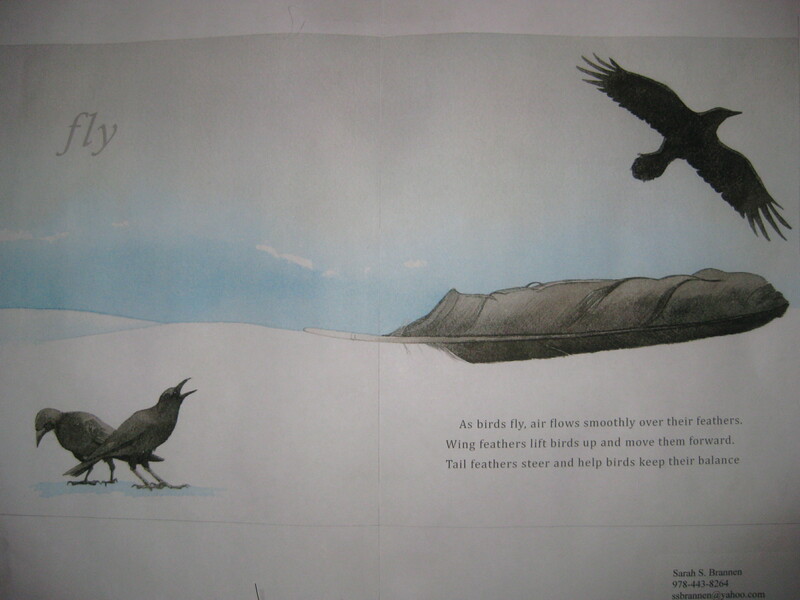 Each spread that follows repeats the pattern of showcasing a mother animal and her young in action on the prairie. The number of young increases by one (2 pronghorn fawns, 3 meadowlark chicks, etc.) as you continue through the book. I like the repetition as teachers of young readers will be able to use these four line poems for shared readings with their students. I would write these poems on chart paper and ask children to find the action words. Then you could have them reenact the action as they pretend to be the animal. One of the nice things about Out on the Prairie is that you can use this book with several grade levels. In North Carolina, students study ecosystems in the fifth grade and there is plenty of information in the back matter for lessons on living things on the prairie. I learned several facts as I read this including information about the bison (not a buffalo) and grama grasses which were new to me. An important fact to pass along is that only 1 percent of native prairies exist in North America. Hopefully, what is remaining can be preserved. 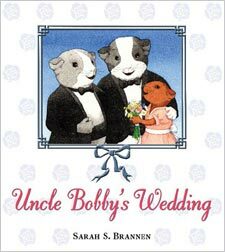 This book also serves as excellent background information for novels such as Sarah, Plain and Tall and the Little House series of books. It has been over 30 years since I visited the Badlands of South Dakota. I knew very little about the region at the time and I remember being pleasantly surprised by the beauty of the area. Out on the Prairie shows us that this is not a desolate area, but a vital ecosystem full of life. Once again here at Nomad Press we’re hosting STEM Friday. It’s a chance for us to feature children’s books from all over the web that incorporate science, technology, engineering, and mathematics. Leave your links and information in the comments. This week for STEM Friday we want to feature two of our books about the solar system. The first, Explore the Solar System!, is for kids ages 6-9, and the second, Amazing Solar System Projects You Can Build Yourself, is for kids ages 9 and up. We’re featuring these two books on space because this week STEM Friday happens to follow two important anniversaries: the anniversary of the first woman in space on June 16 AND the anniversary of the first American woman in space on June 18! In 1963 Valentina Tereshkova, a Soviet cosmonaut, became the first woman to fly in space when she orbited Earth 48 times in the spacecraft Vostok 6. A crater on the Moon is named in her honor. Twenty years later, in 1983, Sally Ride became the first American woman in space on the shuttle Challenger (STS-7). Sally Ride Science has teamed up with ExxonMobil with a project called “Let’s Solve This” to promote STEM inspired programs that transform student performance. 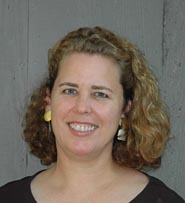 When, in 2009, the Program for International Students Assessment ranked US students 17th in the world in science and 25th in math, Sally said, let’s change that. The only way to change that is to teach and inspire and make these subjects rocket to the top of our children’s interest lists! Hey, this woman went to space. She knows first-hand that the universe is awesome! Sally Ride, you make science cool in our book! Sarah’s sketches had brought the book to a whole new level. She hadn’t just drawn art to match my text, she’d added a whole new layer–a strong, compelling narrative thread, a backstory that simultaneously provides context for my words AND expresses what I’m all about as a writer and a human being. Simply put, I was blown away. 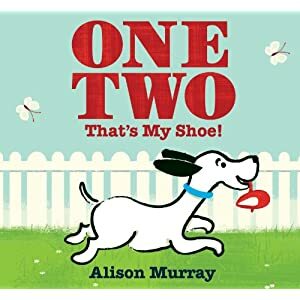 Booktalk: When a mischievous puppy runs off with his owner’s shoe, it’s a race from one to ten to get it back again! 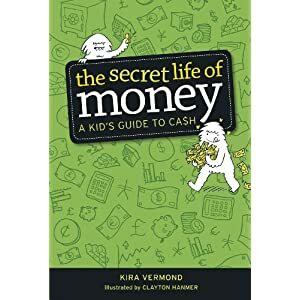 Booktalk: Odd anecdotes, engaging comics, and a wealth of surprising everyday connections help young readers see and understand cash from an entirely different angle. Snippet: Cheddar. Bucks. Moolah. Funds. Bread. Bacon. Beans. Whatever you call your money, there’s a good chance you’re starting to take it a bit more seriously these days. Maybe you’re thinking about taking a babysitting class or mowing the neighbor’s lawn to turn your spare time into pure moneymaking magic. Sounds like a plan. “Right now, all around you, thousands of insects are doing strange and wonderful things,” writes Steve Voake. The problem is, you have to know where to look. 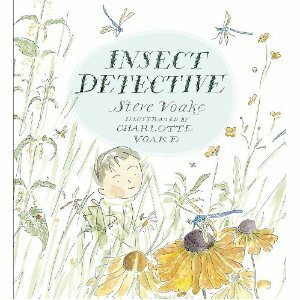 Fortunately, this book guides young nature detectives to the best places to find bugs. Hear that scratching sound by the fence? Sneak up and take a peek – it might be a paper wasp scraping at the wood with her jaws. Want to find an ant nest? Follow that ant! Can’t see any insects? It could be they’re hiding in plain sight, camouflaged to blend in with their surroundings. So look closer. The illustrations provide enough detail to engage readers, yet simple enough to encourage curious naturalists to grab a pencil and sketch the insects they see. Something we should all do: grab a pencil and sketch. Not only is it a great way to document what you see, but drawing something makes you look closer – see more details. The underlying message in this book is that all kids have to is “…open the door and step outside.” You don’t even need a back yard, either. There’s a lot to discover in sidewalk cracks, roadside edges and vacant lots. Voake adds some practical advice for insect detectives in the last couple pages: directions for making pitfall traps, how to construct a bee condo, and tell-tale signs that wasps have been gnawing on your picnic table. If you’re looking for some hands-on ideas for your insect detectives, check out Archimedes Notebook.